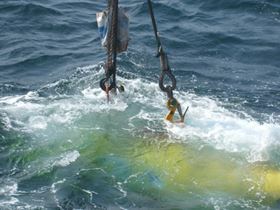 Wave Hub about to go over the side of the installation vessel. 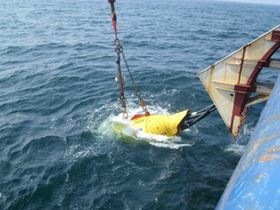 The 12 tonne Wave Hub will act as a grid-connected socket to test wave power devices. 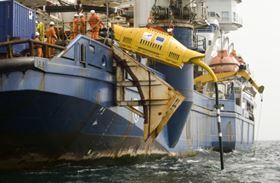 Cable laying ship Nordica lowered the Hub into the water, and 300 m of ‘tails’ have been position on the seabed. The vessel Tideway Rollingstone has already started placing the first of 80,000 tonnes of rock on top of the 25 km export cable connecting Wave Hub to the grid. Wave Hub General Manager Guy Lavender says: “Seeing Wave Hub lowered into the water was the culmination of more than 7 years’ hard work by hundreds of people and the fact that it was designed and built in this country is testimony to the skills and experience that the UK already has in the fledgling marine renewables industry. RenewableUK’s CEO, Maria McCaffery, adds: “Wave Hub is a tremendously exciting development, and a truly world-leading project. It will focus global industry attention on the UK and put the South West firmly on the map in terms of marine energy research and development. The £42 million Wave hub project is being developed by South West RDA. AutoNaut has secured investment from the Seiche Group to advance its research and development.